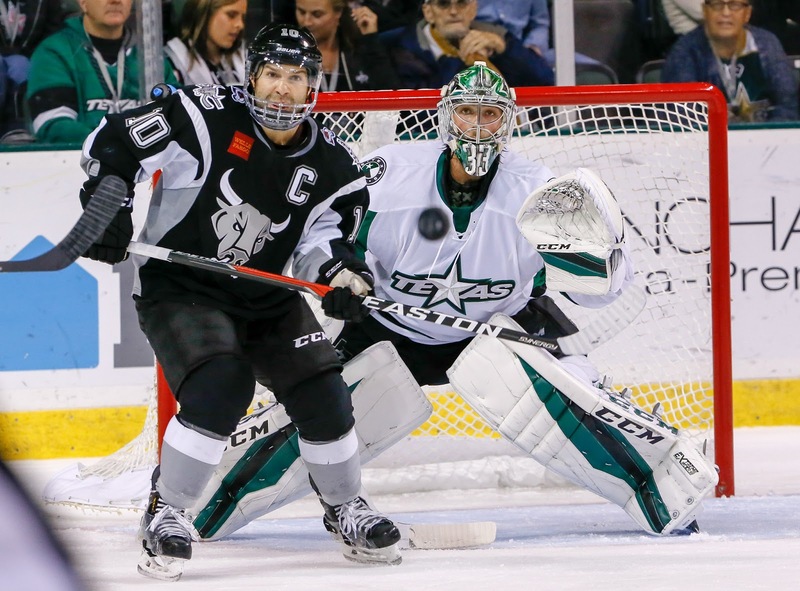 The Texas Stars kept loading up the San Antonio power play, and the Rampage made them pay. Two power play tallies from the visitors and long stretches on the kill combined to hand Texas a loss and put them below .500 for the first time since November 23rd, 2012. "When you take 10 plus penalties in a game, you don't deserve to win," said Coach Derek Laxdal. "It put us behind the eight ball and expended a lot of energy." Newcomer Travis Ewanyk was responsible for 19 of the 33 penalty minutes that Texas had. Early in the first he took a double minor for high-sticking that handed the Rampage their first goal. Minutes later, he bowled over Jeremy Smith and picked up a charging major and a game misconduct. "You can't fault the kid for going to the net hard. He tried to stop on it. The explanation I got is that because the trainer came out [the referee] had to call the major." Laxdal added, "That's the first time I've ever heard that." Spencer Martin would come out in the second period for the Rampage. The Stars would tie things up with a goal by Mattias Backman, but ultimately they spent too much time killing penalties and saw their effectiveness at 5-on-5 dwindle thanks to tired legs. "We're taxing guys on the penalty kill. You put more pressure on six or eight forwards [who kill penalties] and then expect them to push it. You don't have enough gas in the tank." Garry Nunn's first of the year and Sam Jardine's first of his career put the Rampage up 3-1 to end the second period. Matej Stransky found the net late with Lagace pulled but the damage was done. An empty netter put the final at 4-2 San Antonio. As to what to do next, Matej Stransky pointed to some systems work. "You just have to stick to the system. Some of the penalties are stupid, but some of them we're out of position and that leads to a penalty. We have to work on our defensive zone." The Stars will take a day off tomorrow to attempt to get some more energy back into their game through rest. They face a heavy Ontario club on Friday.